Starting March 1, Windows Defender and other Microsoft security products will detect and remove "unwanted" programs that use coercive messages to scare users into buying premium versions of free programs. While some users may not like Microsoft automatically deleting software from their computers, Microsoft is gunning for scareware-like free programs that coerce users into buying premium versions of the software that purportedly fixes the issues discovered by the freebie version. 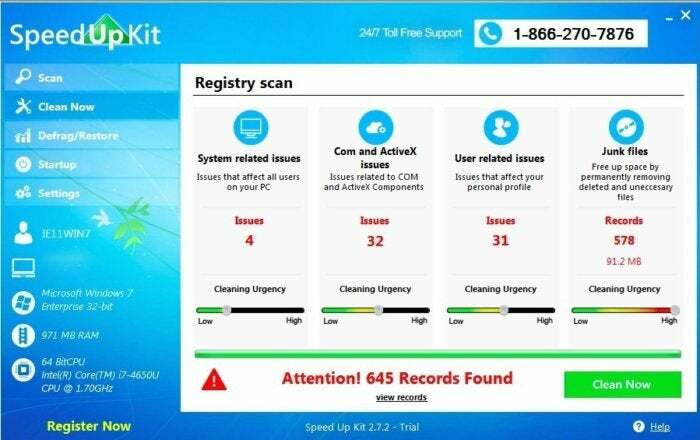 You may not have downloaded that type of software, the kind that scans before claiming to have found hundreds of critical issues, ranging from software to performance problems, but you may have gotten calls from not-so-technically-inclined relatives or friends regarding the “found” problems. Alarmed Windows users who don’t have someone to consult may believe the only way to fix the issues is to buy the upgraded version of the free software. So, what else classifies as “unwanted” software on Windows? According to Microsoft’s updated evaluation criteria, the software will be judged on its unwanted behavior such a lack of choice, lack of control, installation and removal, computer performance as well as coercive messaging. Unwanted behavior: The software runs unwanted processes or programs on your PC, does not display adequate disclosures about its behavior or obtain adequate consent, prevents you from controlling its actions while it runs on your computer, prevents you from uninstalling or removing the program, prevents you from viewing or modifying browser features or settings, makes misleading or inaccurate claims about the state of your PC, or circumvents user consent dialogs from the browser or operating system. Privacy: The software collects, uses, or communicates your information without your explicit consent. Consumer opinion: Microsoft considers input from individual users as a key factor in helping to identify new unwanted behaviors and programs that might interfere with the quality of your computing experience. The evaluation criteria also covers malicious software and the classifications of what consists of malware.